Tables are the bedrock of any restaurant. They literally anchor the entire guest experience, but also- can greatly add to the atmosphere and aesthetic of a space. Increasingly, restaurants are foregoing the old traditional tables right out of a catalog, and instead- opting for custom look. After all, what restaurant wants their tables to look exactly like every other establishment? Likewise, restaurants are moving toward handcrafted pieces, made in America, versus furniture that is mass produced overseas. While cost can certainly be an issue when analyzing domestic vs overseas furniture procurement, there has been a massive shift in the market towards authentic, handcrafted goods that really tell a story. This is especially true for attracting millennial patrons, who highly favor authenticity over mass produced anything. 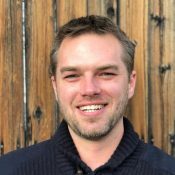 So when purchasing tables for your restaurant or commercial establishment, there are three critical concepts to consider. 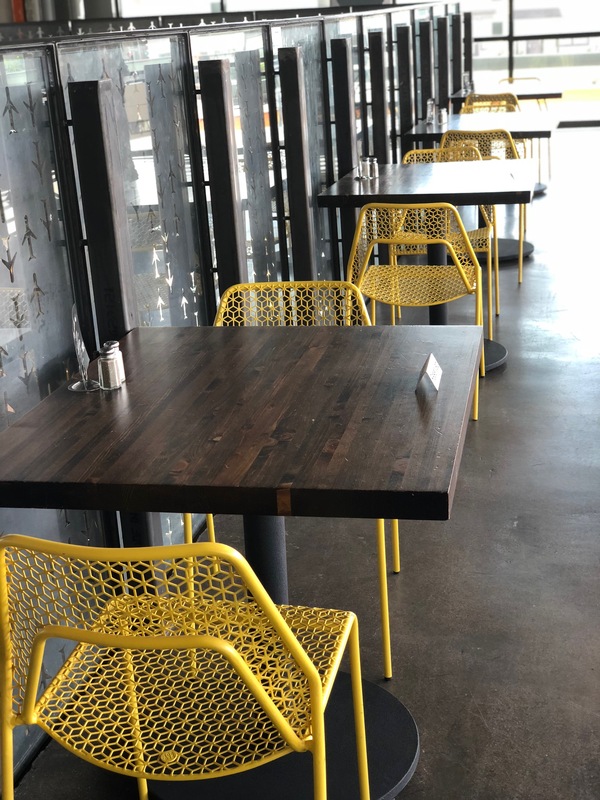 With the shift towards custom restaurant furniture, there are so many possibilities now for materials that aren't available in a mass-produced model. Here in the American West, we frequently use Blue Stain Pine (aka Beetle-kill Pine) for restaurant tables. While the nature of pine inherently is softer than more traditional hardwoods, it can age beautifully with character unfolding over time. 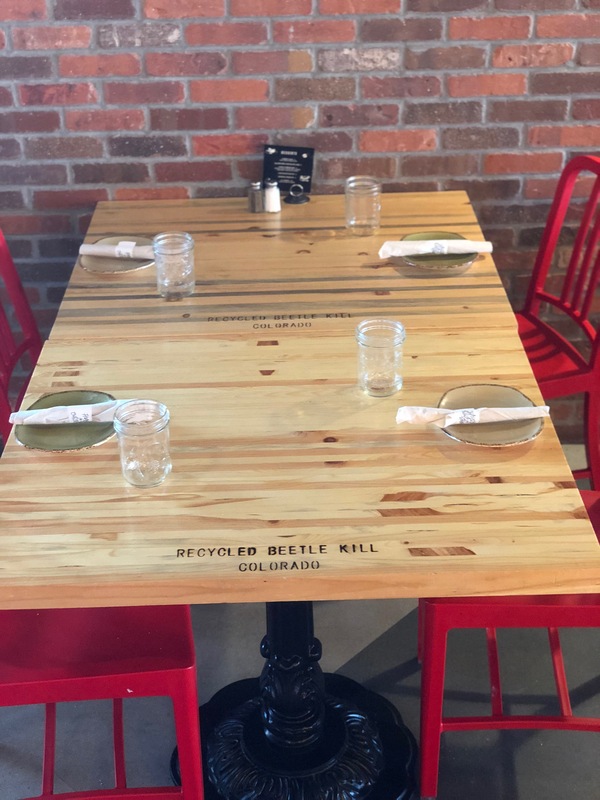 We also frequently use creative, reclaimed materials in our custom restaurant tables, such as tractor-trailer flooring, or old barnwoods. 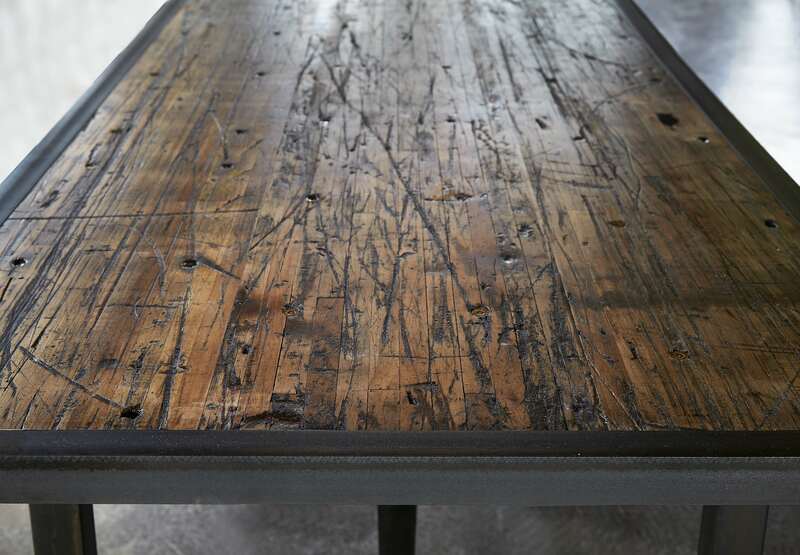 Tractor trailer flooring has beautiful character for restaurant or brewery tables. In addition to the creative aspects of different materials than traditional hardwoods, there's also sustainability consider. Beetle-kill pine is very detrimental to forests, as these dead trees pose a huge fire hazard, and hinder healthy new growth. We're helping to create healthier forests when we use this wood. Likewise, using reclaimed or recycled materials- such as tractor-trailer flooring- is always a better option than cutting down healthy trees for their hardwoods. In short, think beyond traditional woods for your restaurant tables. There's endless possibilities when you go with custom furniture. An additional component to consider in your table selection is finish. While a finish is instrumental in helping to protect the wood over time, that finish can be stained to create a variety of different looks. Between stains, paints, and polys- the options are vast and can greatly influence a restaurant's vibe. Notice in the two pictures below, a dramatically different effect is created. The tables in these two photos are made of the same material- Beetle Kill Pine. In the example below, we stained the restaurant tables a rich dark brown. Our restaurant tables made with Blue Stain Pine, with a dark walnut finish. 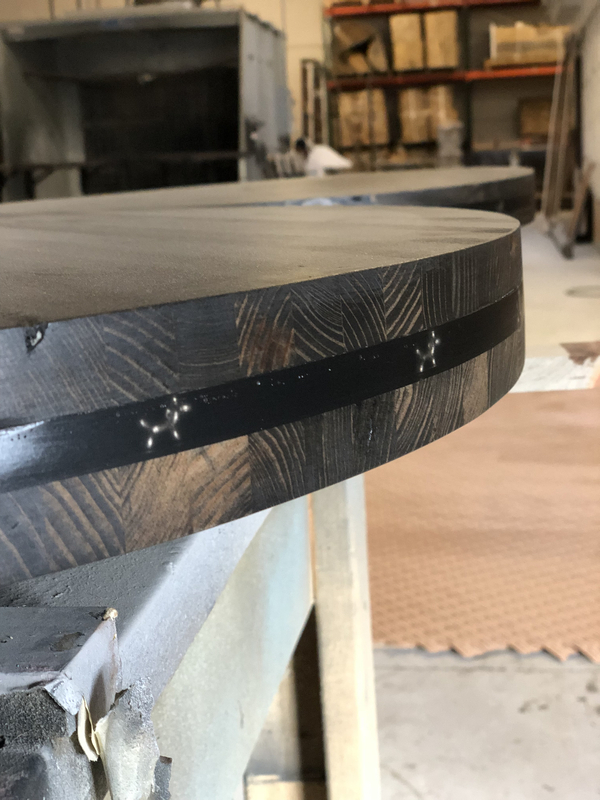 In the picture below, we finished these tables using just polyurethane, allowing the natural colors and grains of the wood to remain prominent. While these two photos show tables of the exact same wood type, they have a completely different impact on the aesthetic of the restaurants. Custom tables we made for a restaurant in Chicago: basic poly finish. In the image below, you see the dramatic difference between several finishes on the same wood species- Alder. Think about your restaurant's design- would a charred finish fit? Or should you go with a more clean, natural look? Either can be achieved via simple stains or finish processes. From Clear Lacquer, Epoxy-Filled Knots & Cracks to Charred Finish, many different looks can be achieved via the finish process. When designing tables for your restaurant or establishment, don't be limited to just the material or wood type. Be sure to also consider the finish, and what the vibe will be for your entire space. The last critical concept for restaurant table design is branding. We always ask our clients: what creative elements can we incorporate to help tell your brand's story? Tables are the most pervasive element throughout restaurants. Why settle for something boring and normal? Brainstorm how you can take advantage of this valuable real estate within your restaurant to bring your brand to life and show your unique identity. Perhaps it's literal branding. We've worked with several restaurants to create an iron brand of their logo or name to then add to their table tops. Or, in other cases, we've created the logo by hand using wood burning tools. This can pack a heavy visual punch, and should be used strategically throughout a restaurant. In the photo at top, we burnt literary quotes onto each table for a library-themed brewery. We've also added small details to tables, in order to bring the restaurant brand to life. In the picture below, we used upholstery tacks bearing a likeness to bullets for a western vibe for the tables at a bar-b-que restaurant. Be thoughtful and deliberate in what elements you can add to your restaurant tables. Creative design elements in restaurant tables. For a recent project, Punch Bowl Social in Arlington, VA, we in-laid tiny balloon animal charms into epoxied resin in the middle of the tables. This created a highly creative, whimsical look, in an otherwise "normal" table. Your restaurant is unique and compelling. Your tables should be too. Remember these three critical concepts when selecting your restaurant tables.